Microbes, Soil & Plants–How Do They All Work Together? Another fantastic question!! Now is a great time to discuss the “soil foodweb.” This term, soil foodweb, was actually a term coined by Dr. Elaine Ingham. If you don’t know about her, be sure to go check out her work and prepare to learn A LOT! Microbes–they’re all around us, in us, on us, below us, surrounding us. They’re everywhere. And that’s a good thing! Without microbes we’d be dead in a New York minute. They help us develop, digest, resist disease, get rid of wastes inside our body, and all sorts of other things. Initial research shows that children with a healthy microbial profile have MUCH better health outcomes later in life than those without. It’s the same with plants and soil. A handful of soil that is healthy will have several MILLIONS of microbes, and at least one MILE of fungal filaments (known as hyphae). 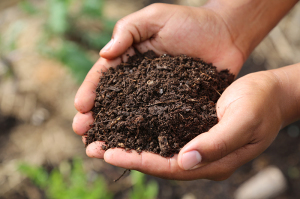 Please note this has nothing to do with the nutrients in the soil….soil can have tons of nutrients in it (nitrogen, phosphorus, potassium, calcium, etc.) but be completely sterile, meaning it has no microbes in it. That’s bad. That’s very bad. Really healthy soil will have both nutrients AND microbial life in it! Here’s why. Just like our own bodies need lots of microbes in our gut in order to properly digest food and absorb the entire spectrum of nutrients we need, plants need microbes in the soil to work with their root structures to absorb all the nutrients in the soil! Yes, plants can absorb some nutrients without microbes–but no plants can absorb all nutrients without the help of microbes in the soil! Here’s how it works. Some nutrients simply can’t be absorbed directly by roots–and here’s how microbes help. Microbes can digest some nutrients that plants’ roots can’t, but excrete a form of that nutrient that roots CAN absorb. Phosphorus is a great example (and so is zinc, copper, etc. etc.). Plants can’t uptake that mineral in it’s raw form; what they CAN absorb is the excrement of microbes that DO eat phosphorus. What happens without those microbes present? Not a happy ending. Microbes are so important to plants that plants will excrete nutrients through their roots call “exudate” (eggs-OOO-date) that attracts microbes to the roots’ surface. It’s truly a symbiotic, win-win situation for the plants and the microbes. So, feed the soil–meaning take care to ensure your soil is a healthy place for all these great microbes to live. That will go a long way towards ensuring your plants are healthy, have great nutrient uptake, and importantly–produce fruits and veggies that have the full spectrum of nutrients that they’re supposed to have. As a bonus, here’s a video of of Dr. Elaine Ingham discussing the role of soil microbiology in soil fertility. admin on What Can I Put In My Bokashi Bucket? Thijmen on What Can I Put In My Bokashi Bucket? Where should I put my Bokashi Bucket? Place your Bokashi Bucket where it is easy for you to use but out of direct sunlight and away from any heaters. Inside your kitchen, garage, laundry room or basement are great places to keep it. What do I do if my Bokashi Bucket smells bad? When done correctly you’re Bokashi Bucket shouldn’t smell. Foul odors come when you don’t add enough Bokashi Activator, add too much scraps at a time, air gets into the bucket, or you’re not draining your bucket. Address these issues to fix a stinky bucket. When should I drain my Bokashi Bucket? It’s good practice to drain your Bokashi Bucket or at least check it for liquids every 2-3 days. Where should I bury my Bokashi Bucket? Alongside your garden bed, around trees or in an area where you plan to plant are garden are great places to bury your fermented food scraps. Anywhere in your yard is fine too. We like to bury ours in a plastic storage bin with some soil or compost. In about 4 weeks, it’s ready for planting!